Is Budweiser Sticking Too Closely To Its Brand? If you want to capture a new audience, you need to be more flexible. “The people who like to drink our beer like to drink beer brewed the hard way,” the ad says. Because…? Poo poo on all those folks who sip beer made the easy way! The problem with the ad’s message, besides being kind of annoying and tired — who isn’t dissing hipsters? — is we aren’t sure what we’re getting when we give up our frou frou beers or whatever it is Anheuser-Busch thinks we’re drinking when we’re not pounding Buds. “It packs more calories than a light beer (and more calories than Guinness, for that matter), costs more than truly cheap brews, and is less flavorful than most craft beer,” the article says. 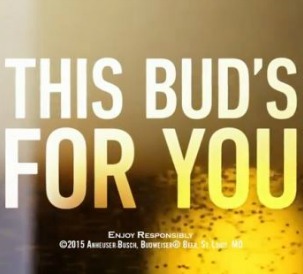 While the clip makes it clear that you should choose Bud over the microbrew competition, it isn’t clear what your getting for making this decision. There’s a reference to “suds” somewhere at the end of that ad. But I get that when I drink most other beers too. You know what else you have a lot of in that clip? Iconic Bud labels and logos just flashing and zipping over and over again across the screen at a seizure-inducing pace. There are a few horses thrown in for good measure also, though they decided to let the puppy hang out in the barn in a pile of hay. Budweiser has been selling itself as a sentimental favorite; a piece of Americana that you drink because you value dogs and farms and friendship. Familiar things. But the brand is trying to reach a new audience. Sure they can probably appreciate these things too, but there are other things that resonate. And probably resonate a lot more loudly. Overall, there needs to be a fresh interpretation of Bud’s place in our drinking lives that actually looks like 2015 and not 1876. So while it’s great that Bud hangs on tightly to its brand’s roots, you can hold on to them so tightly that the brand becomes too rigid and stale to include new audiences. Budweiser doesn’t have to become something it’s not, but it certainly has to be something appealing to people who aren’t drinking it.